Image caption The ombudsman's report concluded: "We will not and cannot investigate this complaint"
A mother whose children were taken into care when she suffered a breakdown after her former partner sexually abused them has been told it is too late to make a complaint. The abuse happened two decades ago but her ex was not jailed until 2015. 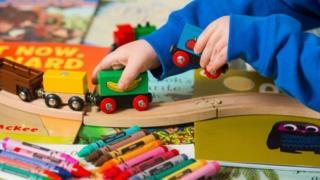 She has lodged a formal complaint over Bristol City Council's decision to take her children into care. But the Social Care Ombudsman has ruled it cannot investigate because it happened more than 12 months ago. The Local Democracy Reporting Service stated the ombudsman's report said: "The complainant, who I have called Ms X, complained Bristol City Council took her children into care after she had a breakdown. "She also complained the police did not prosecute her former partner much sooner for sexually abusing her children. "In 2015, Ms X's former partner was convicted of sexually abusing children using evidence contained in children's services' files." The woman claims police were aware of the abuse at the time, "and so they should have prosecuted him then". But the ombudsman's report concluded: "We will not and cannot investigate this complaint," adding that the events happened two decades ago. It continued: "So the complaint is late, and there are no good reasons for us to investigate what happened so long ago. "In addition, we have no power to investigate the actions of the police and cannot do so." Explaining its role and the reasons for its decision, the ombudsman said: "The Local Government Act 1974 sets out our powers but also imposes restrictions on what we can investigate. "We cannot investigate late complaints unless we decide there are good reasons. "Late complaints are when someone takes more than 12 months to complain to us about something a council has done."